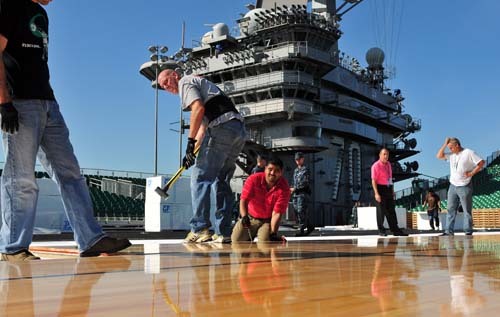 It looks like the first-ever college basketball game played on an aircraft carrier will be played above deck. A rainstorm had threatened to strike San Diego just in time to push the Quicken Loans Carrier Classic into the hangar bay. But it is now forecast to hit the area early on Saturday. Conditions for the game between North Carolina and Michigan State are now predicted to include partly sunny skies and a high temperature of 69 degrees — pretty much perfect for outdoor basketball.